A friend asked me if she could be gardening right now. She’s from a different state that has a climate that allows one growing season. She was surprised to know that we garden year round in North Texas. I gave her the list. In January, we planted red and white potatoes, spinach, kale, and lettuce. And carrots, too. I planted radishes in the same row with the carrots because the carrots take so dadgum long to sprout. The radishes grow long before the carrots. If I don’t plant the radishes, then I tend to lose the carrots. You don’t want to plant something else and ruin the carrot planting. We get to pick radishes not long after the carrots sprout. Yum. The great thing about gardening since we started this is that our kids love it. Mockingbird said this week that we need more radishes–and I’d planted them just to be able to see where the carrots would be, which means I didn’t plant enough. They love the broccoli and kale, too. They’re still turning up their noses at the carrots though. 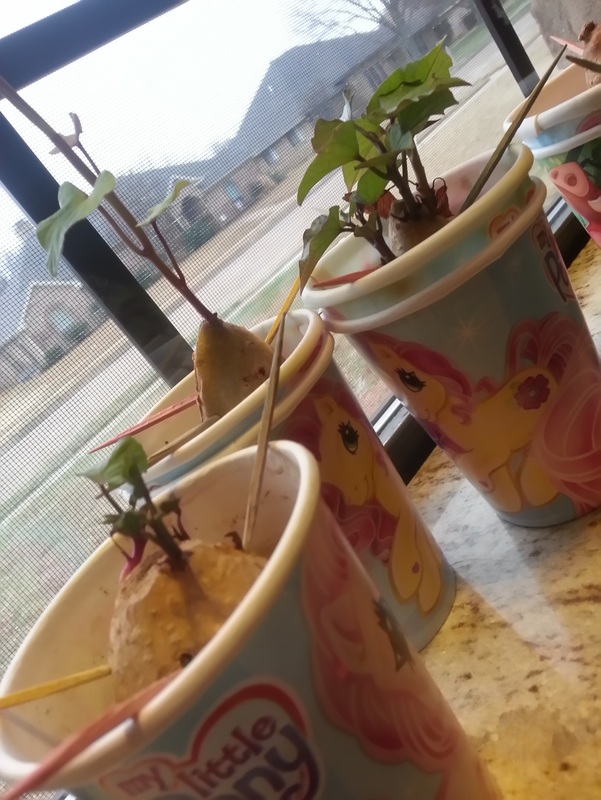 Three tiny sweet potato slips sprouting in party cups. I’m trying something new this year. Sweet potatoes! I must be crazy, because no one I talk to in our local gardening stores knows how to grow sweet potatoes. So I googled it. It’s not like planting regular potatoes where you dig a deep hole and plant the cut up pieces in the ground. Nope. Sweet potatoes want to be coddled and helped along in something called a slip (leaves on the top, roots on the bottom). After buying a few organic sweet potatoes from the grocery store, I waited until there some signs of growth. Turns out, if you try to use a regular sweet potato, the chances are high that the farmer did something to the crop to keep them from sprouting so they keep longer in the store. I cut up four sweet potatoes and put the ends in water. And waited. After two months, I ended up with three sprouting sweet potato slips. Three. One of those has hardly any root system at all. They went into the ground on Sunday. Now we wait some more. Do you garden in the winter? Do you wish you could garden in the winter? What do you or would you plant?